The Grant Thornton Multi Class Regatta proved a challenging one for some competitors with moderate to strong wind and choppy seas, providing demanding circumstances on day 1, seeing improved conditions on day 2. 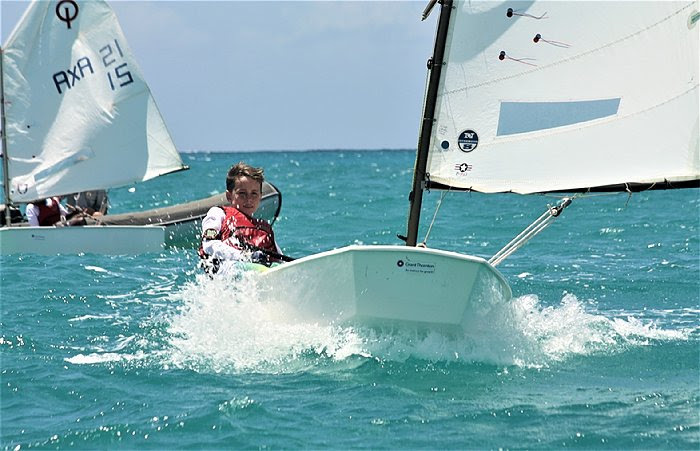 However, no sailor was deterred by a little hard work with 23 competing boats sailing all day Saturday and Sunday morning in Simpson Bay. With teams travelling from St. Barth’s (SBH) and Anguilla (AXA), stiff competition was assured. Whereas some were battling it out for podium places, others were strong and kept racing consistently. With 3 different classes of one-design racing, it was an appealing event for all participants. The Optimist fleet with 14 entries, was the largest one on the waters of Simpson Bay. There were those with years of experience racing hard for every meter in the Gold class and a Silver class for the less experienced sailors, some experiencing what it’s like to race in a regatta for the first time. Most classes sailed 10 races over this two-day regatta. The Optimist Gold class podium winners were St. Maarten sailor, Emma Lennox in third place and St. Barth’s sailors Christophe Maxor in second place and Antonin Sciou in first. Antonin took home the Most Worthy Performance Trophy, including a Baby G-Shock watch sponsored by Ballerina Jewelers, for his impressive 9 first place bullets. The Silver Optimist Class 1st, 2nd and 3rd place went to Deja Carty from Anguilla, Felix Farge and Jules Fortunati from St. Barth’s. 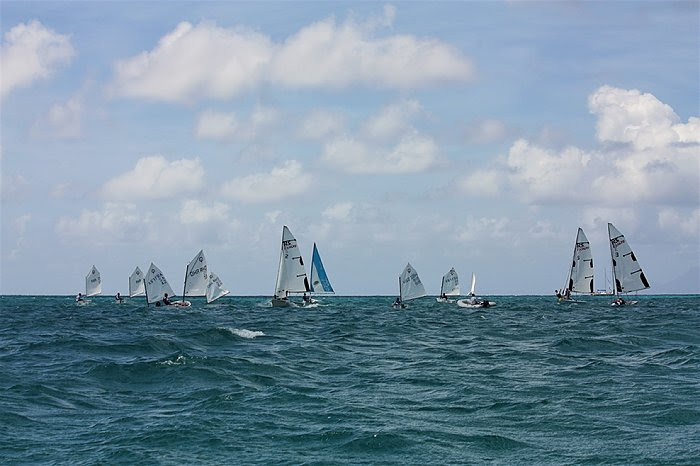 In the Laser Pico class, St. Maarten sailor Louka Williams raced enthusiastically against Oscar Rougter from St Barth’s who came in first place. Oscar also won the Spirit Award for his sportsmanship in this class, which included a Baby G-Shock watch sponsored by Ballerina Jewelers. The 3-island international double handed racing RS Vision fleet consisting of 6 boats (edgy boats sailed with spinnakers which give racing an extra dimension) battled it out for the wins. Riccardo & Trystan from Anguilla showed off their sailing techniques by coming in third place. They are not used to racing in these type of boats, which makes this an impressive result. Summer Jean Morton and Cansu Kilic raced hard on day 1 and took home 5 bullets, but on day 2 Jesse Lake and Mathijs Detering took the first place away from them by less than 2 points overall. All competitors had a fantastic time both days with great on the water conditions and camaraderie ashore. The Grant Thornton Multi Class Regatta would not have been possible without sponsorship from Grant Thornton, Regattaguru.com, Ballerina Jewelers, Island Water World, Aqua Mania Adventures, Timeless Spirits and Domino’s Pizza. About Grant Thornton: Grant Thornton is the world’s seventh largest professional services network of independent accounting and consulting member firms which provide assurance, tax and advisory services to privately held businesses, public interest entities, and public sector entities.